Yeast pitch rates can greatly effect the beer produced. Even a factor of two can be significant. (1) There are several calculators available that can be used to determine the amount of a slurry to pitch, and the volume of a starter. (2)(3) Recently I used one of these calculators, entering the harvest date of the yeast, the thickness of slurry, and several of other factors. In order to pitch the 125 billion cells for the beer I was brewing the calculator indicated that I would need 7.5 oz of my slurry. What I have found recently is that the calculator I used deviated from cell counts by more than a factor of 10! Last weekend I spent some time with my brother, a microbiologist, looking at some of the yeast cultures that I have collected, and did some cell counts to determine density and viability. There were a few ounces of the same slurry that I didn't pitch, so we took a look at it to see how close the calculator came to estimating the number of viable cells. We found that the slurry that I though was 16% viable based on the collection date was actually 60% viable, and the cell density was not 400 billion cells per liter, but rather 2000 billion cells per liter. The result was that I had pitched almost twenty times more cells than were required. As you might expect the fermentation process was ridiculously fast and it reached the final gravity in less than 24 hours. I'll leave this one to sit on the yeast cake for some time to clean up after that crazy party. So far, from the data I have collected, it is hard to correlate viability to harvesting and storage techniques. However, with a microscope and a hemocytometer, this is really a pretty simple task to count viability. My first time counting cells went pretty quickly. We measured viability and counted cell density of four slurries in about an hour. If we had all the materials in the right place, and with a little practice, I image this could be a 5 minute job. 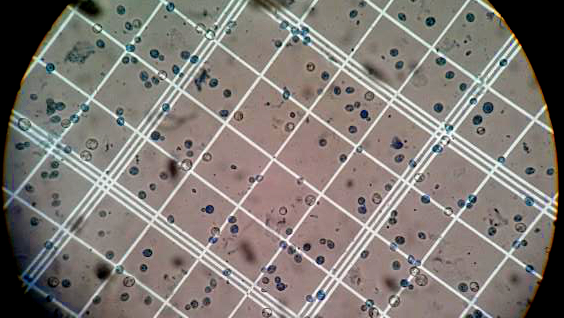 So far it looks like the best way to know how much yeast is being pitched is to count the cells. Everything you've mentioned above has to do with slurry's. Have you done cell counts from various sized starters, and compared it to what the calculators predict? YeastCalc and the Wyeast calc aren't really relevant to slurry counts, as they don't support slurry estimation. That's a good point. In an effort to not point a finger at any one of the calculators I have pointed at all of them by default. I have not yet done cell counts on yeast starters, but it is on my list of things I would like to do. There seems to be very limited data on cell counts of starters. Both Mr. Malty and Yeast Calc use the same set of experiments done at White Labs. White Labs, being very reputable, is likely a very well done experiment, however, it would be nice to see the work duplicated. Well hello there! It was such a huge pleasure to visit your personal blog and to read this post. Also I am so excited to ask you one thing that I am curious of. Have you ever done guest blogging?